Lived and worked in Jeddah for more than four years. Loved every minute of it! 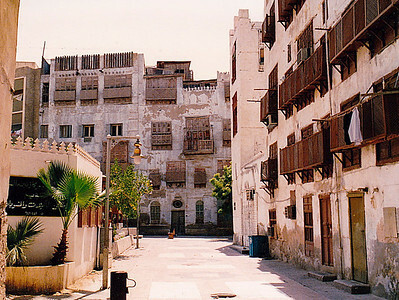 A typical street in Jeddah's old residential and commercial district of Bab Al Yemeni (The Yemen Gate). 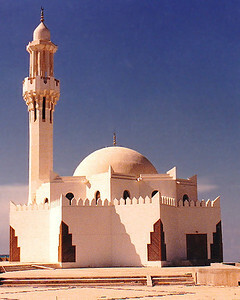 The Hassan Enany Mosque is located on the Corniche Road near Palestine Street. 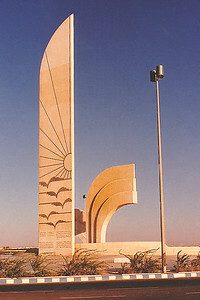 Built in 1984 by architect Raouf Helmi; commissioned by Hassan Enany, a resident of Jeddah. The spacious prayer hall (laid out in the shape of and 8-pointed star) holds1,200 worshippers. The massive golden dome covers the entire prayer hall. 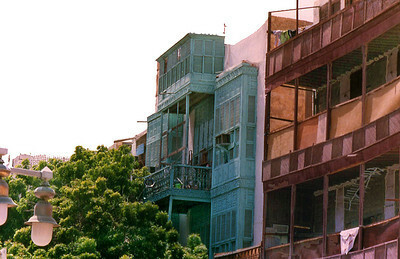 Teakwood shuttered balconies (known either as "shawfan" or "mashrabiyya" in Arabic) are a traditional method of building ventilation for coping with the excessive 100-degree-plus year-round temperatures in this part of the Kingdom. 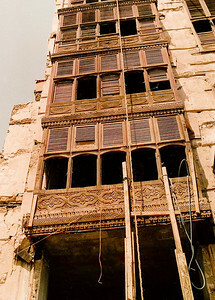 This building (constructed some time in the mid-1800s) sports hand-carved panels on its faḉade. A small but nicely designed neighborhood mosque done in the mastabah-and-minaret architectural style I saw throughout the Arabian Peninsula. It is tucked away on turnout along the Corniche Road, overlooking the Red Sea. 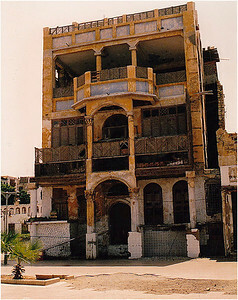 Beit al Canadiya (The Canadian House), located in Jeddah's old residential neighborhood of Bab Al Yemeni, is considered a local historical landmark: T. E. Lawrence (of "Lawrence of Arabia" fame) stayed here from time-to-time during his service as military liaison during World War I. 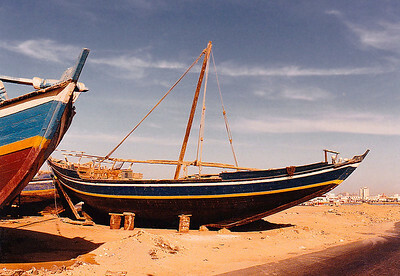 The fishing fleet beached at Jeddah Port, Saudi Arabia. 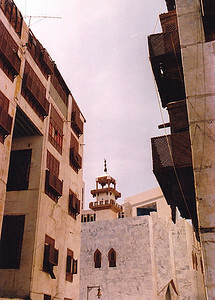 A modern minaret tops the structure of a rebuilt mosque on the site once occupied by one of the oldest mosques in Jeddah. 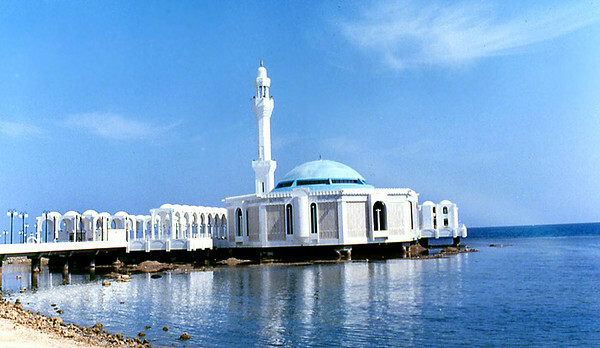 One of the many sobriquets given the city in the distant past was "Jeddah of the Thousand Mosques." I'm not certain that count was an exaggeration: during prayer call, one could nearly go deaf from the chanting of hundreds of muezzins calling the faithful to prayer five times a day. 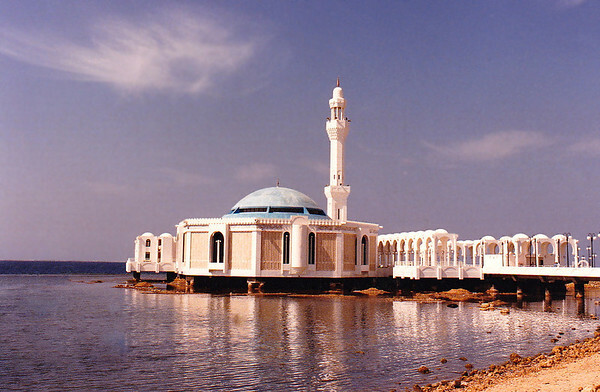 THE FLOATING MOSQUE: This was my favorite mosque! 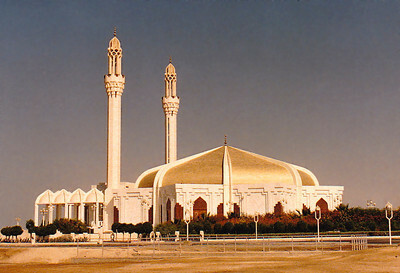 In Arabic, it is called a "masjid." Simple yet elegant, it was unique for its time in that it was built on a pier whose pilings were anchored in the coral shallows along the Corniche Road. Locally, it is known as a mosque for which Indonesian Muslims have a particular affinity when visiting for Hajj or Omrah. Officiallly, it is called Fatima az-Zahra Mosque, after the daughter of the Prophet (although it might also be referred to as al-Rahma Mosque, i.e. 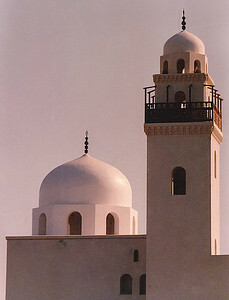 "Mercy Mosque"). 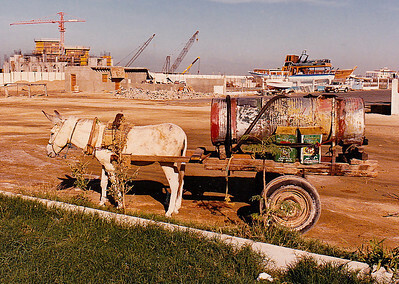 I shot this mule-powered drinking-water caisson early in 1986 at Jeddah Port. I later learned that the owner of this rig was the last of the old-style water vendors who had plied their trade for hundreds of years in Jeddah. The inauguration of a modern seawater purification plant and modern Mercedes tanker trucks did away with this ancient trade almost over night. 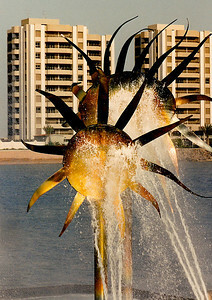 The Finnish artist Elia Hiltunen (1922-2003) created "The Sunflower Fountain", located in amongst some modest high-rise apartments along the Corniche Road. Its "flowers" were made of a specially tinted variety of non-corrosive stainless steel. The fountain's spray nozzles were reported to be nonfunctional as late as 2010. 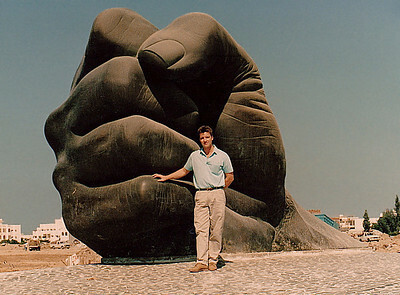 This monumental bronze-cast sculpture, known locally as "The Fist of Sultan" (or simply "The Fist"), adorns Al Amir Sultan Street, one of the main thoroughfares crossing the heart of Jeddah. 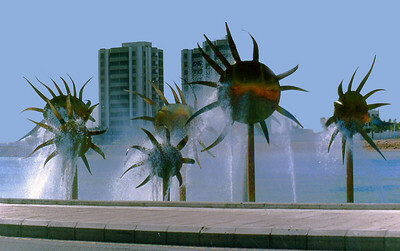 Numerous similarly massive artistic sculptures line the main streets of the newer districts of Jeddah. 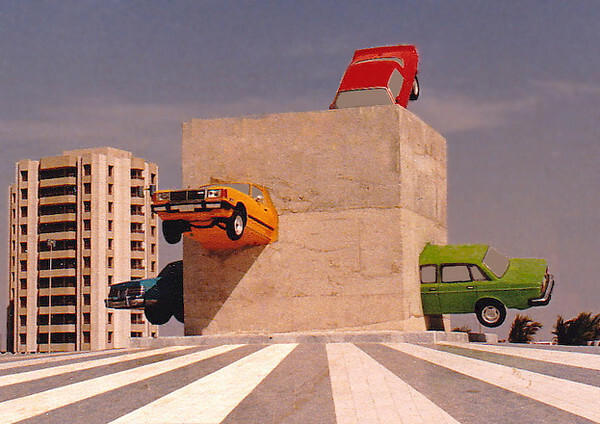 Known locally as "The Cars Sculpture", this "assemblage" of Datsun sedans is embedded in a large block of unfinished concrete mounted on a large plinth situated in the center of a traffic round-about. During the Haj and Eid Al Fitir celebrations, the lights of the cars were lit at night. A closeup shot of one of the cars in "The Cars Sculpture." 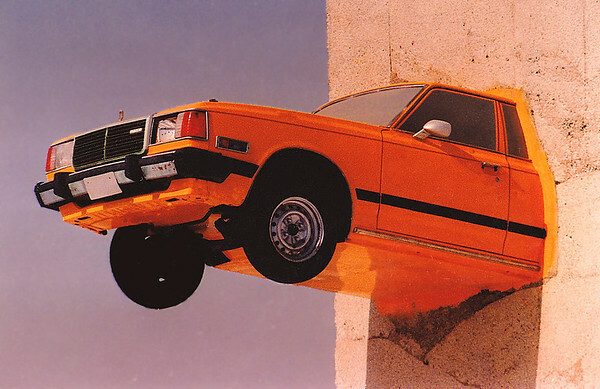 This "assemblage" of Datsun sedans is embedded in a large block of unfinished concrete mounted on a large plinth situated in the center of a traffic round-about. During the Haj and Eid Al Fitir celebrations, the lights of the cars were lit at night. 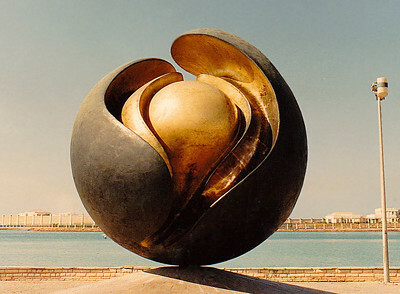 Henry Moore's bronze sculpture "Oval With Points", located on a low plinth on a stretch of sidewalk on the Corniche Road. I found a recent photo of the piece wrapped in protective plastic, presumably to prevent corrosion due to the salt spray. 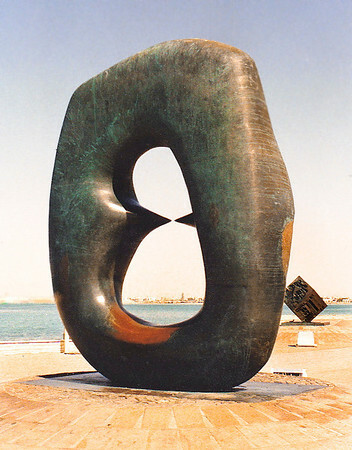 An abstract bronze-and-brass sculpture by Henry Moore sits atop a small plinth on the Corniche, a very scenic street that winds along the coastal district of Jeddah. 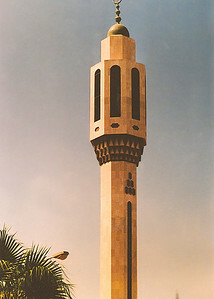 The minaret of a modern mosque crowned by a bronze hemisphere and crescent. When I took this shot of "The Knife" (AKA "The Scalpel") in 1986, this sculpture was situated on an isolated stretch of the Corniche Road. I have since seen an illustration of it included in a city-wide urban renewal plan online document. I knew almost nothing about its meaning or about the inscriptions on its base. An underwater shot I took during one of my numerous SCUBA dives on the fringing reef just offshore from the USGS's As Shuaybah rest camp. 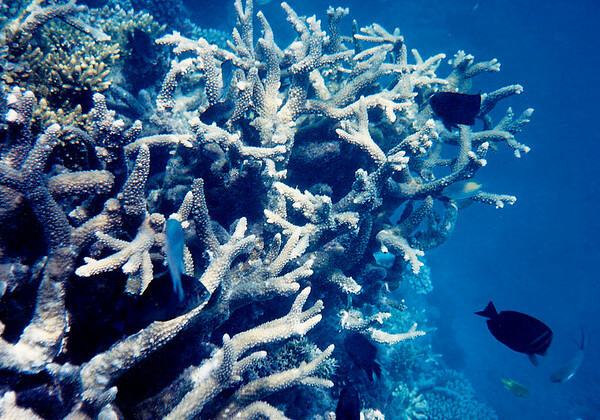 The reef was lush, healthy, and pristine. The visibility was usually better than this image suggests: I often dove in waters with 80-100 feet of visibility. The waters were often so clear as to give one the impression of flying in mid-air. At the time, very few expats were diving on the reefs on the Saudi Arabian shore of the Red Sea.